Make sure that water and fat are cold (between freezing and room temperature), which will prevent sticking of the dough! Sieve the flour into a large bowl, then add salt and the vegetable shortening sliced into rough 1-2cm cubes, then mix to dust the fat with flour and separate bits stuck together. Make a small hole in the middle of the mix, then add 100ml of water, and mix with a fork. Add rest of the water if necessary to make a firm, sticky dough. Knead the dough in the bowl lightly, try not to break the lumps of butter (they will be needed later!) — aim for a "marbled look", i.e. dough should have visible bits of butter. Wrap the dough with foil and refrigerate for at least 30 minutes to let it cool down, distribute moisture across it, and firm up. Dust the working place with flour, then dust each side of the dough when taking it out of the wrapping foil. Flatten the dough into a 2-2.5cm high square, then make sure is well dusted with flour. Start rolling back and forth into one direction, trying to keep it tidy and rectangular. Dust the dough on top, removing any excess of the flour. Fold 1/3 from the bottom, then on top of that fold the other 1/3, making an envelope, and dust the top with flour. Rotate 90 degrees and repeat rolling into one direction back-and-forth. Like before, dust the top, then fold 1/3 from the bottom, 1/3 from the top and dust on top. Repeat last step once more, to achieve 27 layers of dough. Make sure that the dough is dusted between steps, which will prevent sticking of the layers. 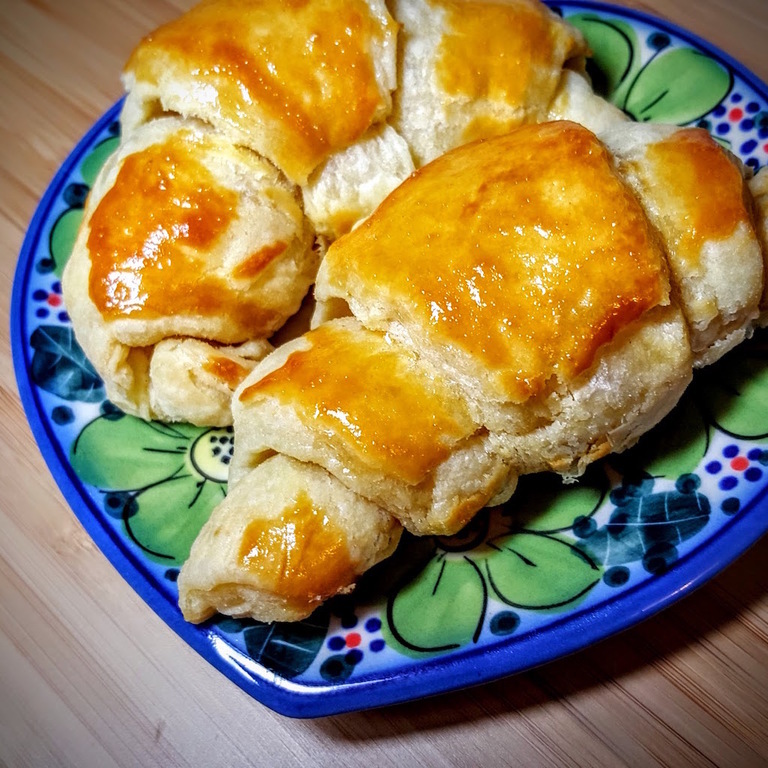 Now it is time for some fun, you can follow the ideas for folding puff pastry presented before, or cut your long stripe of dough into squares and then again into triangles to form small crossaints — slightly stretch the side and roll from the long-side to the tip, to form the well known shape. 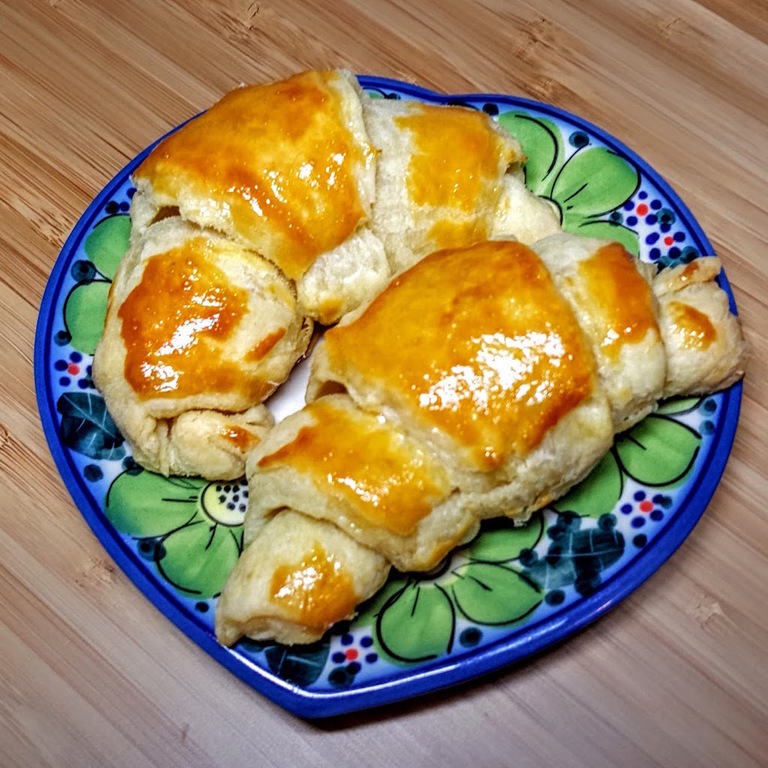 Preheat the oven to 200°C and bake your pastry for 25 minutes. Take them out and lay on a cooling rack to keep them extra crispy!